And I love this one more than the last one!!! I used all Ottobre and Jalie patterns for this wardrobe. This was my plan and I mostly stuck with it. The only deviation I made was with the bomber jacket. I had planned to use a busy white/black Liverpool knit and instead used a woven, non-stretch wool fabric on the front. The woven was white/black/gray but a much more subdued print. Also, for the dress, I didn’t have a thin denim so I shopped my stash. To make it a “real” capsule wardrobe, I tried to keep the number of shoes to four. This is only a few of the combinations that I could have put on. 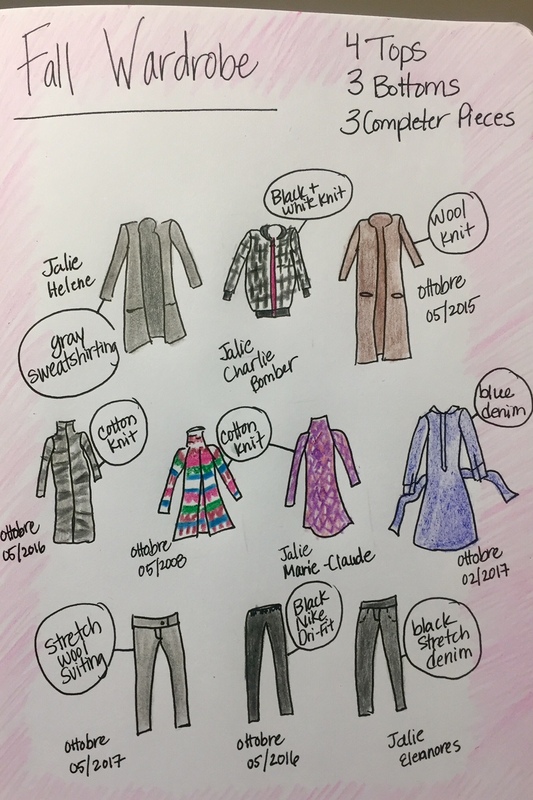 Since the black leggings and the black Eleonore jeans look similar on the camera, I didn’t do all the combinations. When I do this again, I’ll remember to make the bottoms neutral but not so similar. The leggings and the jeans are almost the same garment. But, how much do you guys love this???? I love all the combinations here. I made this long cardigan out of a wool knit. I used a decorative stitch on my machine to make the cream lines. You can see from above that it’s about knee length. I like it and it’s super cozy, but I worry that it looks sloppy. What do you guys think? Out of everything, this is my least favorite garment. I do love it, but maybe it’s too big? Long? Brown? I made this tunic before and wear it all the time. I knew I’d wear this one too. I’ve made this a couple of times already. This is a fabulous pattern. This time, I made the front out of a non-stretch woven that I found at Value Village. Yes, I found this thick, plush knit at Value Village. The back and sleeves are a wool knit. These are black, but are all washed out in this picture. These fit well and are super comfortable. This black denim is really stretchy so hopefully they don’t bag out after a few hours. I kept the pockets plain on these. I’ve made this pattern so many times! These pants are so interesting. The front is constructed like a normal pair of trousers. The back is totally NOT constructed like anything I’ve seen before. The back is folded down over thick elastic. So they are elastic-waisted pants, but don’t look like it. On top of that, the fabric is stretchy so they are, like, the MOST COMFORTABLE pants ever. Here’s where the front waistband and back waistband attach. The back waistband isn’t attached completely, but just topstitched on the darts and the CB. It’s really interesting construction and it makes for really comfortable pants. This is my favorite piece in my whole capsule. It goes with everything and I can wear it alone if I’m feeling racy. This fabric was also found at Value Village. I’m pretty sure it’s a silk blend. It has that silk smell when you iron it. Can you believe that I found this at Value Village? I’m going to start looking for fabric there more often. Definitely too short for work! This dress looks good with everything! I love this knit top. This is my sixth time making this top and I really love it. (Kid version 1 & 2, adult version 3 & 4) I love that you can tuck it in or out. This is a cotton Knit from Girl Charlee. This is the slouchy turtleneck with sleeve cuffs. These are just regular ol’ black leggings because they go with EVERYTHING. This is a matte-finish black Nike Fit fabric. This is all washed out so you can see that there are no crotch wrinkles. This is a great fitting pair of leggings. This is my first time making this cardigan. Of course, since it’s a Jalie, it does not disappoint. I love the cozy pockets! Whoops, I didn’t take an individual picture of this one. I’ve made this before also. Last time I made it in a size 36, and it was too big. This top is the one that is super bright and has the cowl neck. My favorites are pretty much anything with the dress and anything with the gray trousers. What about you guys? What are your favorites?? Whew! Wardrobe Update . . . I swear I've been working away on my fall wardrobe. I can't believe that it's been so long between blog posts though. Wow. Things this fall have been busy and more complicated than usual. Nothing I can't handle, but complicated for sure. On my wardrobe, I've gotten most of my pieces done. 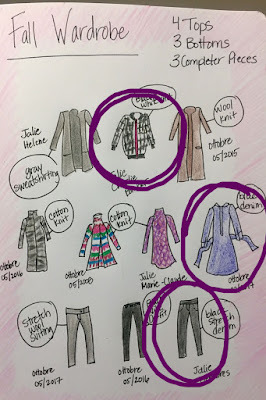 I just have to do the Charlie bomber, the Eleonore black jeans, and the Ottobre dress. I'm making progress, it's just sloooow progress. I love making wardrobes like this. I love executing a plan from beginning to end. I hope I'm done soon because I told myself I can't wear any of the pieces until I'm completely done with all of them! Hope everyone is sewing up a storm. I saw that the new Sewing Bee started on PatternReview.com, FUN! !